The family of seven are living in a caravan without basic facilities such as running water. 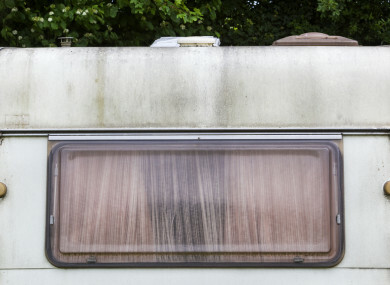 A HIGH COURT challenge has been launched against Donegal County Council’s decision to defer offering housing support to a Traveller family of seven who are living in a caravan without basic facilities such as running water. The action has been brought on behalf of Brian and Eileen Ward and their five children. They are currently living in caravan at Shorefront, Bundoran, Co Donegal. The Child and Family Agency (Tusla) has voiced concerns over the family’s living conditions. The family have applied to Donegal County Council (DCC) for social housing support. The Wards, who have two children with medical needs, were deemed by DCC to be “an unacceptable risk of anti-social behaviour” and the offer of housing was deferred. The family were informed last March that they could make a fresh application in 12 months’ time, but the Wards say the council informed them it would be five years before it would be in a position to offer them housing. The family’s lawyers argue that the council has failed to engage meaningfully with the Wards before arriving at its decision. They also claim the decision was disproportionate and made without relevant considerations. At the High Court today the family’s barrister Mark Lynam, instructed by solicitors for the Irish Human Rights and Equality Commission, said the council’s decision was taken without any input from the Wards – who had been unaware that the process was even taking place. Lynam said the council had made its decision based on the Ward’s housing file rather than putting its concerns to the family for their comment. The Wards claim they should have been afforded a hearing and that up-to-date information should have been sought. Lynam said any decision to defer or refuse housing due to any alleged anti-social behaviour must be proportionate. He said that in arriving at its decision DCC failed to give due weight to Tusla’s concern about the family’s welfare, the conditions they reside in and the fact they are homeless. They currently have no running water and had limited use of a generator. They had tried but had not been able to secure private rented accommodation. In their proceedings against DCC the family are seeking an order quashing the local authority’s decision to defer offering them social housing. They are also seeking declarations including that the council’s decision was disproportionate and breaches their constitutional rights and rights under the European Convention on Human Rights. Permission to bring the challenge was granted, on an ex parte basis, by Mr Justice Richard Humphreys. The next hearing in the case will be in September. Email “Traveller family take action against council over refusal to offer them housing ”. Feedback on “Traveller family take action against council over refusal to offer them housing ”.